NOTIFICATION No. 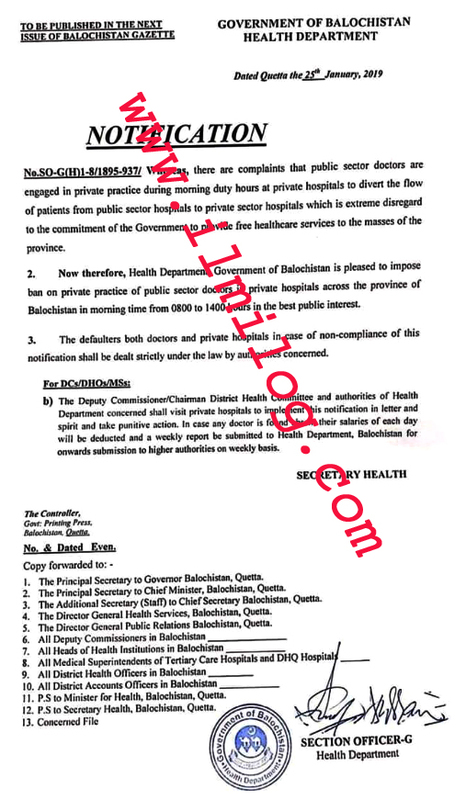 SOG (H) 1-8/1895-937/ dated Quetta the 25th January 2019 regarding a ban on private health care practice 2019 during Public Hours by a government of Baluchistan health department. 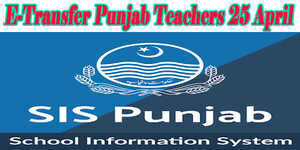 Whereas, there are complaints that public sector doctors are engaged in private practice during morning duty hours at private hospitals to divert the flow of patients from public sector hospitals to private sector hospitals which is an extreme disregard to the commitment of the Government to provide free healthcare services to the masses of the province. 2. Now, therefore, Health Department, Government of Balochistan is pleased to impose the ban on private practice of public sector doctors in private hospitals across the province of Balochistan in morning time from 0800 to 1400 hours in the best public interest. 3. The defaulters both doctors and private hospitals in case of non-compliance of this notification shall be dealt with strictly under the law by authorities concerned. b) The Deputy Commissioner/Chairman District Health Committee and authorities of the Health Department concerned shall visit private hospitals to implement this notification in tenet and spirit and take punitive action. In case any doctor is found absent their salaries of each day will be deducted and a weekly report is submitted to the Health Department. Balochistan for onwards submission to higher authorities on a weekly basis. The Controller, Govt. Printing press Quetta.